Dissolution testing is a pharmaceutical method of evaluating and confirming the release rate of drugs and other orally taken forms in a non-human environment. To understand dissolution testers, you first must understand the basic principal of dissolution itself. When you ingest drugs via tablet and/or oral form, the sample is swallowed and arrives in the stomach, subsequently passing into the intestinal tract. It is from this point that the drug is released from the tablet as the body starts to break apart the sample’s physical content. The speed (or rate) at which the tablet breaks down and the drug is released is very important, as the active ingredients must reach the body’s blood stream within a certain amount of time in order to be effective. This rate at which the drug is released from the tablet is called dissolution. Dissolution can also be measured in other forms of drugs and medicines too, including ointments, creams and patches, which all release active ingredients to be absorbed by the body. Pharmaceutical companies spend a great deal of time and resources creating and manufacturing tablet-based drugs, and thus place a very high importance on the dissolution properties of their products. Indeed, dissolution is a very significant aspect of drug discovery and manufacturing, considering that the time it takes for active ingredients to be released from the tablet and into the body can have a huge impact on the performance and effectiveness of the drug in question. This is sometimes referred to as bioavailability, and the dissolution test can help determine how successfully a drug is releasing, highlight potential improvements, and confirm the release is within the expected parameters. Pharmaceutical companies use special equipment to perform a dissolution test, because although conducting dissolution tests on humans (in-vivo) is possible, it is a much slower, often more difficult process to carry out in a laboratory under time sensitive conditions. Dissolution testing equipment offers the perfect method of performing dissolution tests outside of the human body (in-vitro), with rigorously regulated standards, specifications and compliance restrictions enforced to ensure the tests are carried out in a uniform manner, to a very accurate and reliable standard. The United States Pharmacopeia (USP), European Pharmacopeia (EP) and other internationally recognised bodies set the rules and restrictions regarding the conducting of dissolution tests. In order to measure and analyze the release rates of tablets, pharmaceutical companies use dissolution testers. Often tablets are the primary form of drug being tested, but creams, patches and ointments can also be tested too. Dissolution testers measure the release rate of the active ingredients from a tablet/sample and the recorded results can be used to confirm if the drug is being released effectively, and within expected conditions. All dissolution testers are operated to USP and other pharmacopeia guidelines, and this standardization is very important, because it ensures that all dissolution testers produce the same expected results time and time again, leaving little room for error and erroneous readings. Dissolution testers are used across many departments in pharmaceutical organisations, including Quality Control (QC) to ensure the uniformity and effectiveness of the drugs being manufactured and sold, and by R&D/Manufacturing to evaluate the release behavior and bioequivalence when new drugs are being created. Why are Dissolution Testers used? Dissolution testers are used for a variety of reasons, across many departments within pharmaceutical organisations. Manufacturing and Quality Control departments will use dissolution testers to confirm that the active ingredients of a drug are released in the expected (predicable) way, in the expected and predicated time-frame, so that they can be successfully and safely absorbed by the human body. Other factors are also checked during a dissolution test, such as the uniformity between different batches of manufactured drugs, the predicted shelf-life and long-term stability, and the friability (breakability) of the drug. Dissolution testers have become the accepted standard for testing drug dissolution, and are used across the world, to the same set of internationally recognised standards, making them an excellent tool for producing reliable, accurate results. Because of this internationally recognised test, it’s not just pharmaceutical companies that use dissolution testers; herbal, dietary and veterinary manufactures use them as well. How do Dissolution Testers work? Dissolution testers may vary slightly between the different manufacturers, but all of them operate on a broadly uniform design principal. You commonly have between 6 and 8 rotating, vertical shafts, with a variety of attachments fixed on to the end of them. These shafts are lowered into a glass vessel, while still spinning, and a tablet is added. The glass vessels sit in a heated bath of water (commonly 37.2 C) to simulate the human body temperature. The vessels contain a test media, of a certain ph. value, that simulates the human stomach/intestinal tract. Once the tablet has been added to the vessel and the rotating shaft lowered, the vessel media is continually stirred by the shaft’s movement, creating a small current in the liquid. This simulates the human body’s internal movement. 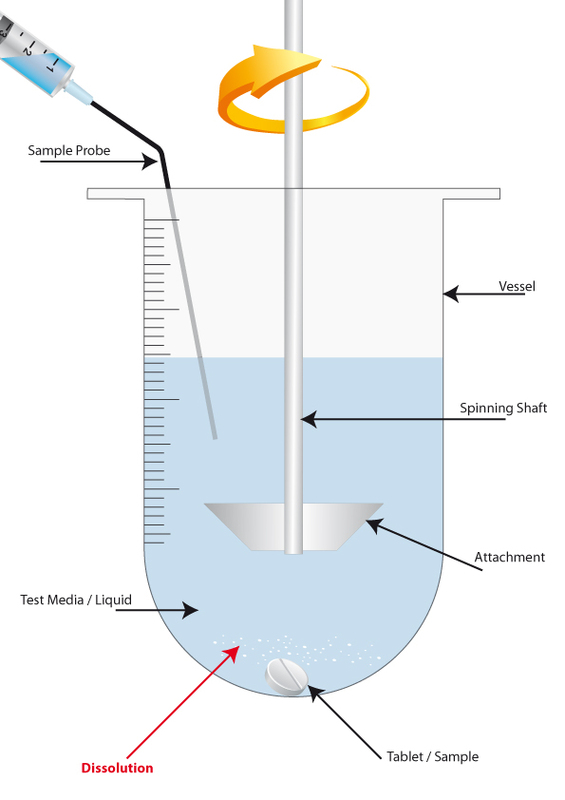 As the shaft turns, the vessel media is stirred, and the tablet slowly starts to dissolve and break apart (also known as deaggregation). As this happens, the active ingredient from the drug is released into the media, and the process of dissolution begins. This process of agitating the media is very important because without it, the immediate surroundings of the tablet would become saturated and dissolution could not properly take place. The relationship between the availability of fresh, moving liquid and the tablet is known as the Shear Rate. It is also important to note that there should always be enough test media in the vessel to allow for continuous dissolution, with no risk of interruption or over saturation. This is commonly referred to as the Sink Condition, and is achieved by always having more test media inside the vessel than is required to eliminate the risk of oversaturation. 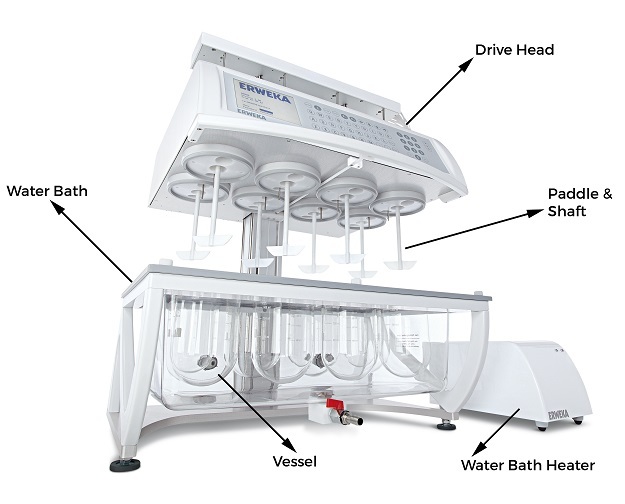 The dissolution tester will run uninterrupted for a set amount of time, and at pre-defined intervals a small sample of the test media is extracted from the vessel and the dissolution rate is analyzed. The results of the analyses at the end of the test will show the dissolution ‘curve’, or, the overall rate of dissolution during the test. These findings are then compared with the expected results and/or used to evaluate the release rate of the drug being tested, thus allowing Quality Control and Manufacturing/R&D departments to certify the drug as working or improve its performance for future batches. Various factors are accounted for when carrying out a dissolution test, such as the known/expected dissolution and disintegration times, the form of drug being tested (Capsules, tablets, suspensions etc.) and the required ph. level. These factors are used to set the test time and sample extraction time, as well as determining the type of shaft attachment used to stir the vessel media. All aspects of the dissolution test are run according to pharmacopeia guidelines and recognised compliance standards, as mentioned previously. The dissolution testers are calibrated and serviced at regular intervals throughout their lifetime to ensure they are always working correctly and to the specified guidelines.